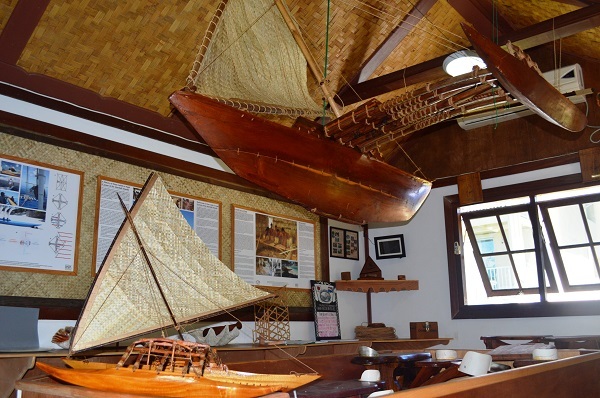 If you’d like to learn more about Marshallese canoes and their history, come and visit the Waan Aelon in Majel’s Visitors Center, which is open during business hours Monday to Friday. The center features a large model canoe strung from the ceiling, a range of traditional canoe-building tools, and a swag of other items related to the program and the history of canoes. On sale are WAM crafts, T-shirts, and DVDs about the canoes and the Marshall Islands. The center was created in 2011 with the assistance of a $10,000 grant from the Pacific Asia Travel Association. It is located in a former program office, which the staff grew out of, relocating upstairs in the main building. At the opening, in September, WAM Director Alson Kelen thanked PATA and the RMI National Training Council for their. “We’re fortunate for all the help we’ve received,” said Kelen. “We start small, but more will grow around the circle. And we invite everyone who wants to contribute old pictures of canoes or traditional materials for the center,” said Kelen. Meanwhile, regular program director Ken Taggart emphasized the need to teach young people to carry on their traditional knowledge. The program currently has 24 trainees. “As part of the canoe building training, we help outer islands by building canoes because they don’t have the materials. If they cut down the trees, they wouldn’t have breadfruit to eat,” said Taggart.